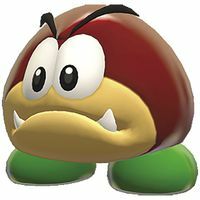 Big Galoombas are rare enemies that first appear in Super Mario 3D World. They are larger versions of Galoombas and can be defeated by jumping on them twice, the same way that regular sized Galoombas can be defeated. Big Galoombas attack the same way Galoombas do, by bumping into the player, and usually come in groups of two or more. They only appear in the levels Big Galoomba Blockade and Gargantuan Grotto. In the former, the player must fight three Big Galoombas on a land patch surrounded by lava. In Gargantuan Grotto, they appear alongside Goomba Towers, Bloopers, and other enemies. Big Galoombas in Big Galoomba Blockade. Only in the Super Mario World style, Big Galoombas can appear in Super Mario Maker and Super Mario Maker for Nintendo 3DS if the player grows a standard Galoomba with a Super Mushroom. Aside from their physical condition, they stay the same as their smaller relatives, only that they cannot be carried after getting a stomp on their heads. This page was last edited on March 10, 2019, at 01:57.